Escaping the single file of commuting cars speeding through southwest Nevada County, he pulls out of line and to a stop. Throwing open the driver's side door, he hops out to open the gate - a ritual made necessary by the livestock on the opposite side. Back behind the wheel again, he drives on through, before braking to tend the gate once more. Then, with a strong squeeze of the hand, a quick click of the latch and a drop of the heavy chain, Frank Smith locks it all out. Two hundred and fifty people are expected hop into the saddle for this weekend's golden anniversary of the Tevis Cup, a 100-mile, one-day ride from Truckee to Auburn. Many of those who will be at the start, won't be at the finish. In recent years, not even 50 percent of the field have reached the final destination in time to earn a coveted finisher's belt buckle. MONTAGUE - Yvonne Underwood discovered Endurance Riding 25 years ago through a friend. If the idea of a sport that requires you to prepare for months in advance, building up yourself and your horses' strength and abilities steadily, involving lots of traveling, entrance fees and medical inspections with the final culmination being a physical token that says 'I did it' then Endurance Riding could very well be for you. This sport began 50 years ago with a simple bet. In 1955 the attitude among horse enthusiasts was that modern horses were not as strong and resilient as the horses during the pony express days. A small group of men decided to test that idea and proposed a challenge to have a ride from through the Sierra Nevadas from just north of Squaw Valley, a parcel of land now named Robie Park, to Auburn, California, a 100 mile distance. The terrain includes steep hills, rocky surfaces, single tracks (narrow trails), creeks, a swinging suspension bridge and a crossing of the American River. Six men began the challenge and five finished. This was the beginning of what is now known as the Tevis Cup ride. JAMES CANYON ? Hoof prints atop tire tracks: Hindi Shahab?s intermingled with those of the ATV in the soft mountain dirt.While just feet away drivers sped unknowing along U.S. 82?s winding curves.In the rural James Canyon area of the Sacramento Mountains, 21st Century technology may tread the asphalt, but remnants of Otero County?s custom and culture remain on the forested trails. For the past two weeks the white Arabian stallion Hindi Shahab, carrying rider Richard Frazier, has trotted along the landscape. He?s training. The two have been a sight, but Frazier?s sights are set on a horizon farther than their eyes can see. Only a dream envisions it. On July 31 he and the Arabian are bound for Lake Tahoe, Calif. to vie for the coveted Tevis Cup, a prize Frazier described as endurance racing?s ultimate challenge. Their competition includes horse-and-rider teams from European and Arabian countries. Depending on the CEI ride you visit, you can meet quite different carrying-out of veterinary inspections, i.e. An official dedication will take place Sunday at 10:00 a.m. at the Mountain Quarries Railroad Bridge located at the North Fork of the American River near Auburn, California. The Mountain Quarries Railroad Bridge was placed on the National Register of Historic Places on February 11, 2004, by the United States Department of Interior. For more information, please call State Park Ranger Mike Lynch at 530.885.4527. LEXINGTON, KY - Governor Ernie Fletcher announced today that the Commonwealth of Kentucky, on behalf of the United States, will submit a formal bid to the International Equestrian Federation (FEI) to host the 2010 World Equestrian Games (WEG). These games are the most important high-performance equestrian competition in the world, and are held every four years in a country designated by the FEI, the international governing body for equestrian sport headquartered in Lausanne, Switzerland. "I am very pleased to announce, along with representatives of the United States equestrian industry and the Kentucky Horse Park, Kentucky's bid to host the 2010 World Equestrian Games," stated Governor Ernie Fletcher. "Our great Commonwealth is known around the world for our state's signature horse industry, and Kentucky would be honored to host this prestigious event right here in the Bluegrass." 3. Curso de Doma Método Monty Roberts. The São Paulo State Endurance Championship - Prêmio Dona Carolina (Dona Carolina Award) was held in Dona Carolina Hotel and Farm, Itatiba, São Paulo on Saturday and Sunday, June 26-27. The Championship was divided in 2 categories: 94,5 km Adult and Young Riders and 74,5 km Adult and Young. In the Limited Speedy Category 54 riders starter in the ride. Felizardo Brandão riding WN Pepsi, Pure Arab, won for the second time the São Paulo State Endurance Championship, division Adult. He completed the course of 94,5 km in 6:50:43, with average speedy of 13,15 kph, With the same horse, he won the 2003 Championship. THE Scottish Endurance Riding Club ride at Lauder was a great success, with the 50-mile race at the top of the bill. A ride which approximately takes around seven hours to complete in total, was won by Lorraine Sloan with her horse Manning, from Northern Ireland, who completed the ride at a speed of 8.4 mph and a finish heart rate of 48 to achieve a gold award. The winner of the Whizz Trophy, which went to the highest placed SERC member and second in the race ride, was Rachel Fothergill on Royal Wonda, who completed the ride at a speed of 7.57 mph and a finish heart rate of 48. The annual Horse and Rider Endurance Race will start just after sunrise today. Almost 300 horses and their riders will set off from Fauresmith in the south-western Free State on a three day journey during which they will cover just over 200km. Willie Matthee, a spokesperson, says seven groups of riders will set off at different times early this morning. They are from South Africa, Botswana and Namibia. Competitors will ride 80km today, 80km tomorrow and then a final 45km on Thursday. Matthee says after every 25km the horses will be checked by veterinary surgeons to determine if they are still fit to continue the race. As part of an initiative by the FEI and the International Conference for Equine Exercise Physiology (ICEEP), the world?s leading endurance vets and research scientists used the FEI Newmarket & Emirates Endurance Office?s 160km ride last weekend as a forum for pioneering work on the development of the sport. During the 160km ride last weekend, researchers looked at weight loss in horses, how their immune system reacted to the exertion, and the question of dehydration and loss of electrolytes. the new proposed wording for the individual qualification criteria based upon input received from National Federations and the detailed review undertaken at the last Endurance Committee Meeting. two separate proposals for Nations qualification criteria which is at an early stage of planning. The FEI asks for the views of the National Endurance Federations on each of the items by the 31st July 2004. I am a representative for Endurance in Czech republic and a chef of equipe for travel to foreign countries. We would like to gather information from Endurance Intercontinental. Also I have a little suggestion to number 7/4 where you have written Záb?eh under SVK (Slovakia). Please correct it. Záb?eh is in CZE (Czech republic). ROYAL Bahrain Endurance Team leader Shaikh Nasser bin Hamad Al Khalifa qualified for the World Championship finals in Dubai next year after completing the Florca Endurance Horseride Race last night in France. Riding Snow River, Shaikh Nasser completed his third 160-km race after earlier taking part in the Bahrain and UK races covering similar distances, while other team members Shaikh Khalid bin Hamad Al Khalifa, Hamad Al Meraisi and Khalid Al Ruwaie, were unable to complete the race. First place went to Issane El Fawsett ridden by Stephanie Arnal, once again a son of the legendary stallion Persik. A good level of participation this year for the famous race of Florac(France). An innovative initiative of the organizers : inviting some of the best French and foreigners at their ride, taking at their charge the registration fees and the accommodation and meals for the rider and his crew. 25 riders were invited, including 16 foreigners from Belgium, Denmark, Italy, Spain, Ireland, Switzerland. This year the date of the race was moved from September to the first Saturday of July to avoid some interference with the Championships that are traditionally held in September. Once again, the talented Alize de Lap, with Yves Preveiraud was not able to cross the finish line at the first place. Alize was second this year, fourth the year before, 6th in 2002, 2nd in 2000, 3rd in 1999! 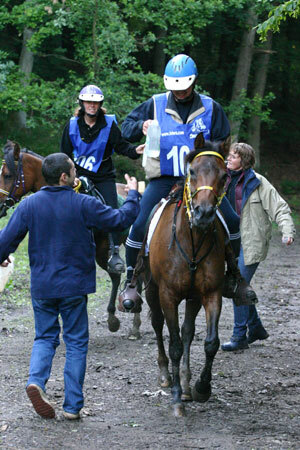 The 2004 Belgian National Championship was won by Jacques Boulanger, riding Shannon, an arab-trotter. The L'Ardenaise - CEI ****/***/**/* event was held 27 June at Harre Belgium. The Harre course is a very very difficult race, taking place in the hilliest part of Belgium, in the south, in the region of the Francorchamps F1 Grand Prix. This is also the region where the famous ?Battle of Ardennes? took place at the end of the WWII. The course presents an unending up and down with an average altitude difference of 400 meters each cycle. The Belgian Enduance squad continues is preparations for the upcoming 2004 World Endurance Championships in Dubia next January. Challenging, upbeat, and inspiring describe the Ride & Tie Championship held the weekend of June 26th , north of the Northern California coastal town of Ft. Bragg. This area is not easy to get to. Once there, the main road is Pacific Coast Highway, 101, which dashes up and down ravines, barrels around hairpin curves that give a roller coaster view of seaside cliffs and ocean, and under mini forests that all but block the sun. The road, which is often dangerously obscured by fog, is bordered with lupine, sweet pea and tall grasses that even in the drought of summer still bring color to the wind swept land.